The Barbados Hammock Single - Sorbet is the most popular single hammock of the Arizonas Brazilian line by Byer of Maine. It is traditionally hand-crafted in Brazil and the 100% cotton design is guaranteed to be more comfortable than your favorite t-shirt. 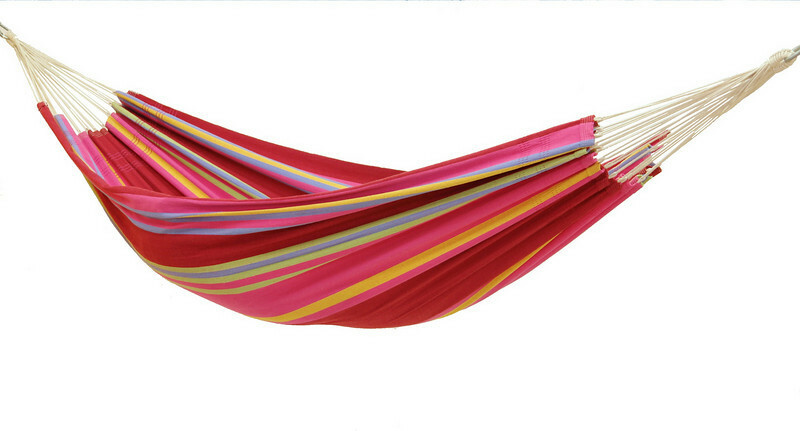 This pastel striped Brazilian hammock is a wonderfully cozy hammock for one or two, and it is the ideal hammock for sharing a relaxing afternoon by yourself or with that special someone. Just as comfortable in the house, on the porch or on the balcony, as in the garden or camp. *Comes with matching cotton bag for storage. *Pillow for display. Does not come with pillow.